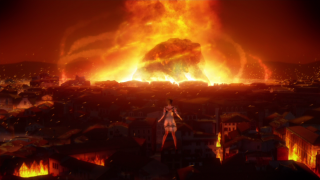 The Day of Disaster, seen in Elise's vision during the opening sequence of Sonic's story. The Day of Disaster is a catastrophic event which takes place in one of the possible near futures of Sonic the Hedgehog (2006). Retroactively preventing the Day of Disaster from occuring is the chief motivation behind Silver's story in the game. Ten years before Sonic '06's main timeline, the Solaris Project accidently split a hyperdimensional phenomenon called Solaris into two seperate, demigodly beings: Mephiles (a cunning and malicious creature of black smoke) and Iblis (a semi-sentient fire spirit). With the help of the grey Chaos Emerald, a time-travelling Silver and the mortally wounded Duke of Soleanna managed to seal Iblis into the soul of the Duke's daughter, Princess Elise the Third. With his dying words, the Duke instructed Elise never to cry, as doing so would release Iblis into the world. As it turns out, this was good advice. Silver hails from a future where Iblis eventually was released, and the world is not in the least bit pleasant. Towering fire-cyclones; sunless, smoke-clogged skies; permanently erupting volcanoes; post-apocalyptic cities eternally burning in a sea of living flame... and soforth. What survivors were left (and Mephiles implies there's at least enough humans left to start a witch-hunt) named Iblis' release as the "Day of Disaster". Although the event itself is never shown during the game, Elise hallucinates / prognosticates Soleanna being consumed by fire during the opening sequence. After the paradox at the end of Sonic '06, history is rewritten so that Iblis is never split from Solaris, let alone released into the world, thereby eliminating the Day of Disaster from the future. This page was last edited on 10 August 2010, at 19:28.